Fresh summer blueberries are paired with sweet red bell pepper in this gourmet salsa recipe. Blueberry and Red Bell Pepper Salsa is a winner! Cilantro lime salsa is loaded with ripe Roma tomatoes, fresh veggies, tons of flavor and a secret ingredient that will make your taste buds dance! The watermelon salsa recipe is so fun when served from a watermelon bowl at parties! It is delicious with chips or on top of grilled chicken or salmon. This Fresh and Easy Pineapple Salsa recipe only requires 6 ingredients and 15 minutes to make. It’s the perfect appetizer for your next party and would also go great on some tacos for a little crunch. This perfectly scoopable Lazy Day Salsa is a classic tomato salsa that is whipped up in a flash (no chopping required). It is speckled with bits of onion, garlic, and cilantro for extra freshness. This salsa is so easy you can make it in 10 minutes (it actually takes me about 5) . The best part is, you can add it to leftover chicken, burgers, casseroles, and viola you have the perfect dinner. This jalapeño cilantro salsa reminds me of a chimichurri style sauce because of the combination of olive oil, garlic and herbs; even though traditional chimichurri uses finely chopped herbs. This smoky guajillo salsa recipe is deep and flavorful, full of toasted, dried guajillo chiles, garlic, and fresh tomatoes. It’s the perfect smoky salsa recipe to keep in the fridge (at all times, pretty sure) so you can put it on all the things. Inspired by my favorite local taqueria salsa, you’ll love this smoky salsa recipe, especially during warmer weather! This pineapple salsa recipe has a delicious combination of sweet and spicy. It can be served with grilled chicken or fish or as an appetizer with chips. Fire roasted tomatillos and cherry tomatoes pair beautifully with spicy jalapeno, onion, and garlic in this non-traditional salsa verde. A little sweet, a little tangy, a little spicy – all delicious. Straight out of the ASP garden, freshly picked Creamy Avocado Salsa Verde that will make your head spin! A few months ago I picked up Organic Fresh Tomato Salsa at Costco and it totally changed my salsa makin’ life! It’s the best tasting salsa EVER. I mean, I’ve had my share of salsas but this stuff does not compare to anything else. I don’t know if it’s the extra veggies in the mix or what but something about it that is uncontrollably good. It’s the perfect combination of fresh, zesty, with a touch of heat and ton of cilantro. Pair it with your favorite bag of tortilla chips and you have one of the easiest and freshest appetizers of the summer! AVOCADO SALSA VERDE, an easy to make recipe with less than 10 ingredients! This salsa is perfect for an appetizer, snack or a sauce drizzle on top of some chicken or fish! It’s a question commonly heard in taquerias and kitchens around the world. There’s always someone in the room who needs their salsa bordering on volcanic. Well, say hello to Fire Salsa. This is the best Pico De Gallo recipe and is made from fresh tomato, cilantro, onion, and jalapeno – makes the best salsa ever. Some people refer to this as salsa fresca. Fire Roasted Salsa – easy restaurant-style salsa you can whip up in the blender with zesty lime, and spicy roasted tomatoes! This Restaurant-Style Chipotle Salsa recipe couldn’t be easier! Get those tortilla chips ready because you’ll be dipping & scooping in no time! 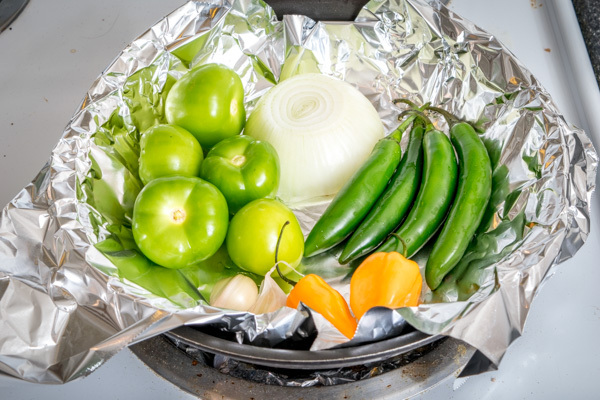 Nothing will transform your kitchen more than having go-to recipes for the two pillars of Mexican cuisine: red sauce and green sauce. Lately, I have found myself thinking a lot about Cinco de Mayo so I figured that I might as well get an early start and this chunky avocado salsa was first on my list. This salsa is super easy to make where you just need to dice some avocados, jalapenos, tomatoes, and onions, hit it with some lime juice, throw in some cilantro and finish things off with a touch of salt. Are you a salsa lover? I go through phases of snacking on it repeatedly, then I won’t eat it for a long time. It’s been a while, so I recently made this crazy easy and delicious Black Bean Salsa. Are you sitting down?…. because I’m sharing the best damn salsa ever, with you today! If you’re a salsa person and I know you are, you have got to give this delicious homemade salsa a try. The bright, fresh dip is absolutely irresistible- loaded with delicious, vibrant flavor and it comes together in less than 5 minutes. This is one of our absolute favorite salsa recipes and it’s SO EASY. Literally, roast your ingredients and throw them into a food processor and BAM you’ve got the perfect salsa. Who else loves chips and salsa? I figured as much… it’s such a classic snack! I love salsa when it’s fresh and smooth, with small pieces of tomato, onion, jalapeno, with cilantro and lime juice. Bright and fresh with a kick, as the best salsas are! I bought all the ingredients to bake a cake to celebrate, then my dishwasher broke down. I was not about to wash all those dishes by hand. So, let’s shout happy birthday with this mango salsa recipe that I made for a potluck last weekend. It’s colorful, right?! Almost looks like confetti up close.